This model features a heavy duty 2 piece fiberglass deck as well as an integrated bow locker. 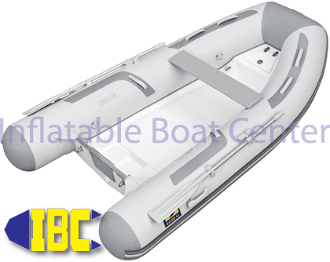 This boat also has a fiberglass bench seat and two seat positions as well as oars, foot pump, large self bailing drain, lifting eyes and d-rings, integrated hand holds. One of the best built best performing small RIBs on the maeket today. Because of this model's performance it is often imitated by other makers with lower quality materials and offed at a lower price. Be sure that you are getting the genuine Zodiac 310 RIB to avoid disappointment later.